"The Mafia had shown all the skill of a modern corporation." I find the fixation on mobsters as characters in film and TV a bit disturbing. True, their lives make for some interesting storytelling, but these are basically some of the most cold-hearted, cruel people you could imagine. Sure, Tony Soprano is fun to watch. He says funny things. But he also does horrible things. I think, at times, people forget that these revered mob characters cinema has created (Tony Montana, Don Vito Corleone, Tommy DeVito) are based on some of the most violent men who ever lived. It is good, then, that a documentary series like A&E's Mafia: The History of the Mob in America exists. Here, the true face of the mob is revealed, with none of the glamour or sexuality of the movies. The Mafia ran many cities (including my own Chicago) during the Prohibition Era, and it wasn't just the "bad guys" they killed—innocent citizens and store owners were targeted as well (as illustrated in the opening scene of The Untouchables). These were not nice people. Mafia, hosted by Bill Curtis, examines the mob from its beginnings in the immigrant sections of large cities, and follows through to the swan song of Vegas. Throughout, the "story" is told with a combination of old newsreel footage, crime scene photographs (some very graphic), and interviews with various historians. The presentation is a bit on the dry side (I would not recommend watching all five episodes in one sitting), but the content is riveting. It was great to see the real history of the mob. Though separate episodes, the first two installments really go hand in hand. The Prohibition Years covers the events leading up to prohibition (what factors influenced the vote), and focuses on the start of bootlegging, speakeasies, and the illegal liquor trade. 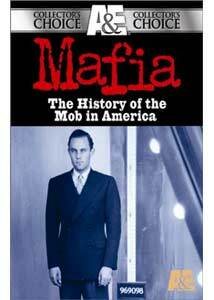 Birth of the American Mafia then picks up in the late 1920s, and explains the rise of an organized distribution of illegal liquor, begun by the Italian, Irish, and Jewish immigrants that eventually gave birth to such characters as "Lucky" Lucciano and Al "Scarface" Capone. Oliver Stone fans will want to check this one out. It covers the twisted family history of the Kennedys, which has ties to the liquor trade. Evidence is uncovered linking JFK's narrow victory in the 1960 presidential election to mob tampering with the voting (especially in the much-desired Illinois). The episode concludes with an examination of the possible mob conspiracy to kill the president, and I have to say, it's pretty plausible. Unions have become incredibly powerful in today's job market, and this episode investigates one possible source of that power. The emphasis here is on the close ties between the heads of the various mob families and the heads of different unions. Apparently, the Mafia would "do the dirty work" for the unions, who would then owe them favors. Some damning evidence is offered, as well as an in-depth portrait of Jimmy "Where'd he go?" Hoffa. Closing out the disc is a look at the last glory days in the mob, primarily in their booming business in Las Vegas. Basically covering the same thematic ground as the film Casino, the episode was, for me, the most interesting on the disc. The rise and fall of the mob in Vegas has been the inspiration for a number of films, and this is an in-depth look at the reality behind them. Image Transfer Review: This is a difficult transfer to review because it uses so many clips and newsreels, all in differing states of disrepair. Overall, the image looks only ok. The old newsreels are, of course, not in the best condition, but the photographs at least look nice and sharp. Unfortunately, the newly recorded interview segments look very soft, like they were taken from a VHS master. Of course, the image is watchable, and really, inconsequential, as the information is the thing. Audio Transfer Review: The audio fares better than the video, but this is still a very plain transfer. The narration and interview segments are well represented in the center channel, and are always understandable. The older newsreel footage, however, is a bit difficult to understand at times, and there is quite a bit of audible background hiss in several segments. Still, overall, this mix serves the film well. Extras Review: Nothing is included outside of scene selections. I really would have appreciated at least subtitles. It isn't much to look at, but despite the reliance on photomontages and "talking heads," Mafia: The History of the Mob in America is a comprehensive, engrossing documentary series. Recommended for all you obsessive mob fanatics out there.